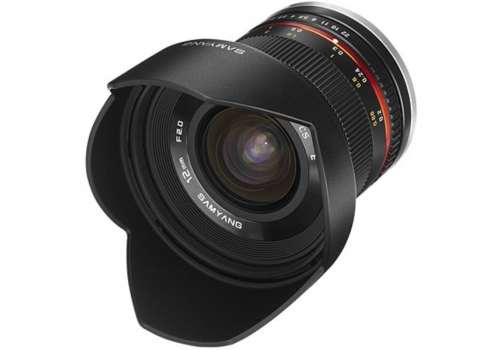 This Samyang 12mm F2.0 NCS CS Lens is available to fit a wide range of mirrorless system cameras, including Canon M, Fujifilm X, Samsung NX, Micro Four Thirds, and S0NY E mount compatible cameras. On a Micro Four Thirds camera, as tested here, it offers an angle of view equivalent to a 24mm lens on a 35mm camera. The build quality of the Samyang 12mm F2.0 NCS CS Lens is excellent. It feels very solid, despite weighing only 245g. The lens mount is metal and the lens is also compact for a lens with a bright f/2 maximum aperture. This makes the lens a perfect companion for more compact Micro Four Thirds bodies and it balances well with the Panasonic Lumix GX7 used for testing. Aperture control and focusing are both completely manual, as the lens has no electronic interface with the camera. The aperture ring is divided into half stop intervals, and clicks firmly into place for each. The focusing ring is well damped, and smooth to operate, which makes focusing a pleasure. Focus distances from infinity to the closest focus distance of 20cm are marked on the ring, but no hyperfocal scale is provided. Taking images of anything over a metre or two away is straightforward, as the lens can simply be left set to infinity. For closer distances it is recommended to use the magnification or focus peaking features of your camera to ensure sharp focus.